WCR: Your last record, Fox & Weathervane, came out in 2006. What took longer on the new record? PF: It just took longer because our schedules became busier. When we started on the first one I wasn’t in a full time rock band, and then when we started this record, I definitely was. Plus, Carl’s mastering business took off - he has been super busy with that, so that’s really the only reason. How did you and Carl meet? He mastered the first album I did as The Warmth, which was really just a solo album that I did with some friends in Indianapolis. A friend of mine recommended him because he was starting to do mastering. I randomly sent him an e-mail and asked him if he wanted to remix one of the songs, because I knew that he had done some electronic sorts of projects. He was in this band called Emperor Penguin, and I just knew that was something he would be able to do, and it worked out really great. We kept working together 'til we had an album’s worth of stuff, and we’ve just never stopped. How does Vulture differ from Fox & Weathervane? I think that the songs are more concise. I think that this time around, because I was there the whole time, I was able to talk to Carl about what my initial ideas for the songs were. A lot of the songs on the last record were really long, and that was something that I wanted to tighten up a little bit. In the past I would give him a three-minute song and it would come back eight minutes. I think the new album is stronger than Fox & Weathervane. 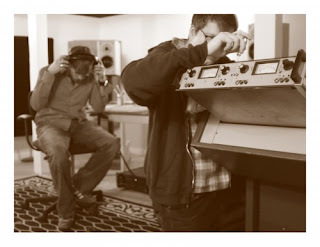 Talk a little bit about The Warmth’s recording process. I put together around eight tracks, and then I transfer that to Carl’s computer and we go from there. So the basic structures are always kind of my ideas, and then he is the mastermind behind all the rhythm tracks - he adds synthesizers, sometimes guitar, and other bits and bobs. But for the album before this one, we worked separately a lot. I would do my bit and then I would send it to him, and then he would just work on that on his own, send me mixes and we would exchange ideas. But he’s become so busy now that really the only way we can get anything done is if I go to his house and we sit together and work on it. So it’s been a little different. I really like that, just being able to collaborate. What are the strengths that each of you bring to the table? Well, I’ve kind of come to the realization that I don’t really like working on music on a computer, and Carl is like a wizard at that. That’s his main strength, and he’s really good with synthesizers too. I do a lot of that stuff at home, so all the synth tracks are sort of half me, half him, but I think the rhythm tracks, bass and drums, and some of the synths are his primary focus. So what songs are you particularly proud of on Vulture? I like "Harvester’s Hand” a lot, I think people seem to like that one. I was really happy with the arrangement on that one. When I gave it to Carl it was sort of this really basic, simple song, and I was actually thinking maybe we could just make this acoustic guitar and vocals, and add some reverb to the vocal, make the acoustics sound good, and keep it really minimal, but that’s not really what we do so we went with the route that we went and I really like the way it came out. I don’t think there is any electric guitar on that song and that’s sort of a rarity for us. The last song on the album, “Denny’s Last Dream,” I worked really hard on - there were a lot of vocal harmonies and it starts off with the chorus, which is something I find is not easy to get to work right. That song I was really happy with. I did a lot of the basic tracking at home on that one. Somebody told me today that the album sounds like The Doors, which kind of freaked me out. With your busy schedules, what inspired you to keep working on this project? I just have too many songs really, I write too much to use those songs with the other band that I’m in. I like to write, so it’s sort of a habit that you get into - when you finish a song, you just immediately move on to the next one. I don’t like to not have a song in progress, it makes me uncomfortable. I guess because there’s that fear that one day you’ll be like, “I can’t write another song, I don’t have anything new.” I haven’t run into that.